For Sound ID, a company with roots in audiology, the Sound ID 510 Bluetooth headset, billed as the world's first wireless headset with its own personalized iPhone app, has been a labor of love. Instead of developing the slim unit as just another Bluetooth device, it was designed from the ground up with "ear-gonomics" in mind, says CEO Michael R. Jones. The $130 Sound ID 510 comes with multiple earpieces and an earhook so each user can get a comfortable fit, but also works with Sound ID EarPrint, a new iPhone app, to tune its audio quality to your own ear. The free app is available for download in the Apple iTunes App store now, but the unit, available in black or white, won't arrive at AT&T stores until June 6. "Your ear's like a room. It has its own frequency response [characteristics]," Jones said during a recent meeting in New York. The EarPrint app, he explains, works as an equalizer while adjusting audio compression as well. Users are presented with a simple line grid with a Sound ID logo at the intersection of two lines. Tap the iPhone screen and move the dot around with your finger and the quality and tone of the sound changes. Depending on where you stop, the unit may be set to soften loud noises or increase soft ones, Jones says. You can also use EarPrint to enhance your hearing when you're not in a call. Setting the unit to "Environmental Mode" passes ambient sounds through to your ear; thus, the headset doesn't serve as an earplug when you're not in a call. EarPrint works only with the Sound ID 510 -- it needs to connect with and identify the unit before its functions become available. Three microphones and Sound ID's noise-suppression technology separate voices from other sounds, thus making outgoing audio clearer. "That really takes care of the people on the other end," Jones says. The Sound ID 510 has a simple on-off switch and volume is controlled by sliding a finger up or down the length of the unit. 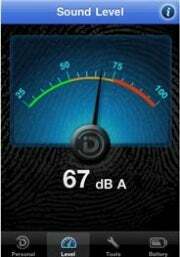 EarPrint offers a sound level meter so you can monitor whether the incoming audio is approaching harmful levels. While it appears to have a solid color, the unit is actually encased in a clear, hard, scratch-resistant coating. Absent-minded users can use EarPrint's Find Me function to locate the unit if it's misplaced nearby. Once triggered, the headset's LEDs will flash brightly and if you don't find it within a few seconds, the headset begins to squeal -- first quietly and then loudly. EarPrint also includes a battery status indicator. The unit, which supports Bluetooth 2.1+EDR, is rated for 5.5 hours of talk time and 135 hours of standby time per charge. While it doesn't support A2DP at the moment, a free downloadable firmware update slated for June will enable the unit to connect to and stream music from digital audio players. Jones says the delay in implementing A2DP support was to make sure the firmware worked with as many Bluetooth devices as possible. "The myth behind Bluetooth is that it's a standard," he said with a chuckle. "Everyone does it differently." EarPrint apps for the BlackBerry and Android platforms are forthcoming, he adds.